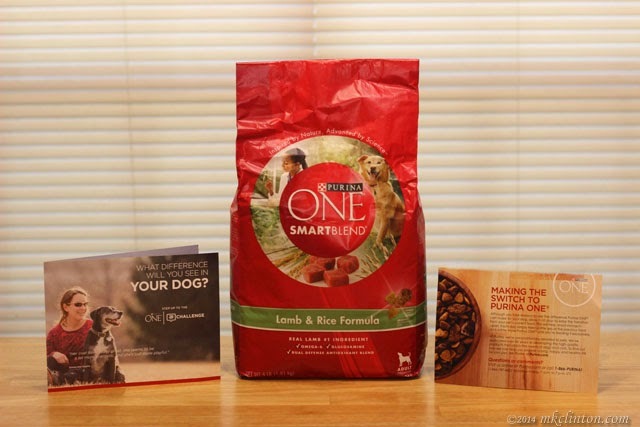 Purina ONE is making a 28-day challenge to see how their SmartBlend dog food can make a difference in your dog. I am not sure if I will participate in the challenge as I have other dog food on hand. If it were left up to the dogs, they would be great with taking the challenge. They really love the food. Pierre has gotten finicky about his dry food. I introduced him to a certain gravy that I poured over his regular food. Now he expects ALL of his food to have a gravy or sauce. (Sorry Jessica) Instead of broth or water, I added the new food along with their regular brand. Pierre ate his bowl without looking up once. 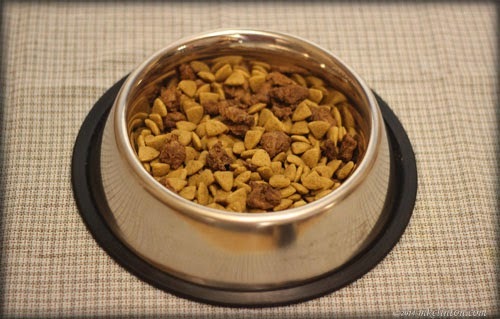 SlimDoggy gives Purina ONE Lamb & Rice dry dog food a 3.0 out of 5.0 that is obviously medium. Our regular food ranks higher and I respect the rankings of the SlimDoggy App. The ingredients listed for the Purina ONE SmartBlend Lamb and Rice that I received, the first ingredient listed is lamb. From the lamb, it goes to brewers rice, whole grain corn, whole grain wheat and poultry by-products. I have been feeding the boys grain-free for a while, so I’ll be interested in seeing it I notice a difference. your best friend. It works around the clock with a blend of Vitamin E & A along with zinc and selenium in a 100% complete diet. It supports your dog’s strong immune system and helps supports healthy skin along with a radiant coat. I appreciate KLOUT for another great PERK and Purina ONE for letting us try their tasty new food. Bentley: “Now Mom, do you really think that we’d leave you? Who would feed us, scratch our belly, and clean our poo? Don’t be silly, we would never leave y’all. We moved to our own store tab at the top of our blog. This is the price from Bentley's Bargains Store before extra 20% off. The boys do their secret paw slap behind my back and wink. Klout Influencer Disclosure: I was given a free product because I’m a Klout influencer. I am under no obligation to receive the sample or talk about this company. I get no additional benefits for talking about the product or company. Hey Shiner got this perk too! She used to eat this exact food on a regular basis and did very well with it. Enjoy. Have a tremendous Thursday. I'm a ProPlan guy. Per the Vet. Did I tell y'all I knew it was Bentley studiously working on his blog? He is very distinguished lookin'. Our mom used to feed their FURST Ever Dachshund Purina ONE. I am not a fan of Purina. 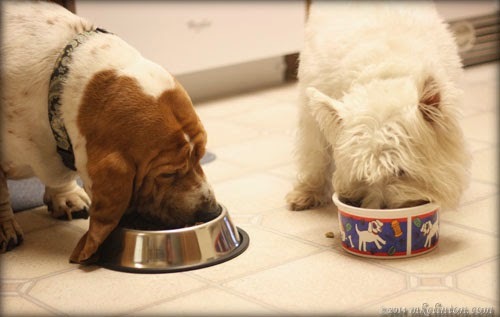 They have never ranked well in the dog foods, although they have came up a wee bit. Great post though, and it sounds like an interesting challenge. Lol don't say sorry to me! Poor baby isn't gonna know what to do when we get him back hahaha y'all have spoiled him rotten! Lol love y'all! We never tasted it before so we tried to "scratch 'n sniff" on your post but it didn't work! Pee Ess - Were you the ones asking about the campaign/election? If you were, it is NOT over until election day on November 4th. Our big debate is coming up soon! You will want to cover that fur sure on your broadcast! We were really into Klout about two years ago, but we just don't have enough time for it these days. Last time we logged in, it had changed so much we had no clue what to do! Good call moving your store to the top of the blog, boys! You really have some business savvy. We ordered from your store a couple weeks ago, and what an awesome bargain it was! Actually, we can give your news reporters a top concerning the Debates. Just email us at cecampbell@msn.com and we can give you some insider information! I feed my gang Purina Pro Plan and they love it and do well on it. Thanks for this great review on this purina product.